Shari MacDonald Strong: Hello, Internet. I'm Still Here (Barely) . . .
Magic 8-Ball Says: "Signs Point to Yes"
I'm trying to catch up after weeks of chaos: one move, a complicated remodel, lice (one of the kids), mice, sugar ants, various bouts of flu/vomiting (me AND the kids), a trip to Seattle, a sad breakup of dear friends, weeks of living out of boxes, and more miscellaneous everyday crises than I can count. My in-box has 870 emails. Is it time to declare email bankruptcy and start over? I think it just may be. More soon. In the meantime: Does anybody have my beloved, marked up copy of Sue Monk Kidd's The Dance of the Dissident Daughter, which I loaned out to I-can't-remember-who? And in the "I Have Been Put in My Place" Department: Last night, Macky and I were talking about where he would be going to school for kindergarten next year: his Montessori preschool, or the public school. He kept going back and forth -- choosing one, then the other -- before finally giving up. Macky: Mama, you can think about it and decide. Me: You don't want to decide? Macky: No, Mama. I said that YOU can think about it. (Pause.) In your head. (Pause.) WITHOUT TALKING. Oh AWESOME. Judah put me in my place yesterday morning by telling me my breath smelled like "ugly spinach." 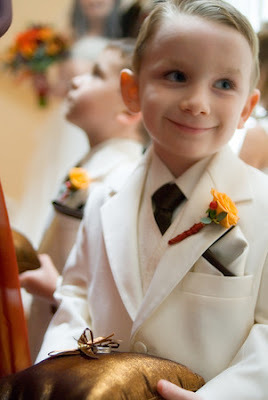 Macky is so sweet in his ring bearer tux! Oh Man! Macky makes me melt. I am so glad you are alive and pretty much well. We send our love and will bring you a pizza if you like. I can't wait to see the remodel and the kids and you and Craig of course! Big hugs to all! I was sort of beginning to wonder what had happened to you!